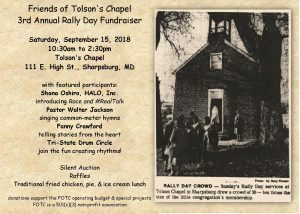 Join us for a day of music, fun, food, and a great opportunity to support the Friends of Tolson’s Chapel’s mission to preserve and interpret historic Tolson’s Chapel! This year we will feature Shana Oshiro, Executive Director of HALO, Inc. (African American women barbershop quartet) to introduce to us their “Race and #RealTalk” program (we’ll be bringing the whole group back in the 2019 season! 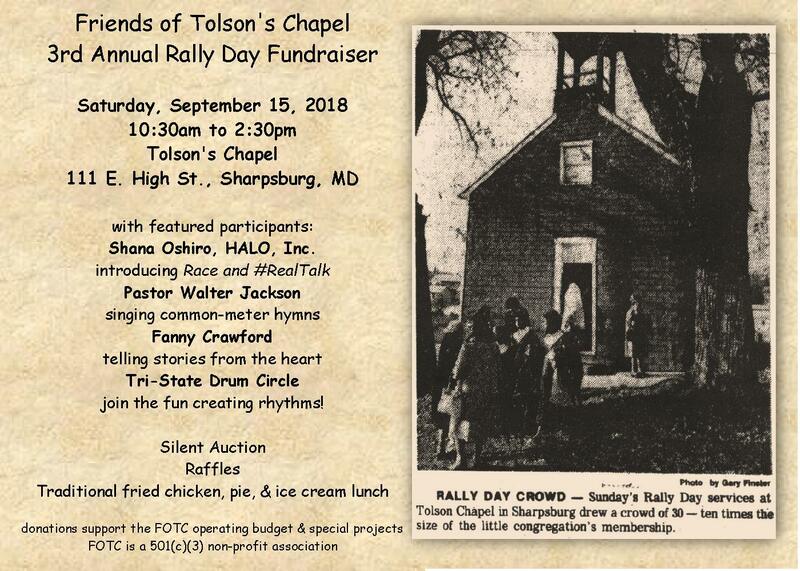 ), and Pastor Walter Jackson from the Wainwright Baptist Church in Charles Town, WVA to sing traditional common-meter hymns, Fanny Crawford will share her storytelling talents, and the Tri-State Drum Circle is returning to help us find our rhythm. We’ll have silent auction items (look for item posts in this event beginning September 1 for early bidding!) and raffles through the day, and the traditional fried chicken, pie, and ice cream Rally Day lunch fare will be available for purchase. This entry was posted in Uncategorized by ediewallace. Bookmark the permalink.